First of all, I want to wish you and your families a blessed and Happy Easter!! I will continue to have some scheduled posts as I will be going back home to be with family again. I am sorry I won't be spending much time blogging/commenting for a little while. I need to be with my Dad and family as much as I can right now. Thank you for understanding and for all the prayers for my Dad~they are appreciated!! 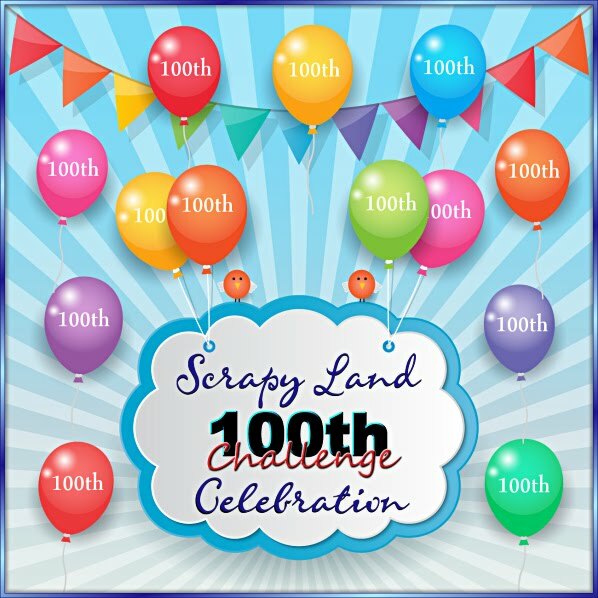 Also, you still have a little time to come join us in the challenge at Scrapy Land that is still going on. The theme is "Anything Goes" plus use a brand die Scrapy Land sells. We'd love to have you come join in! 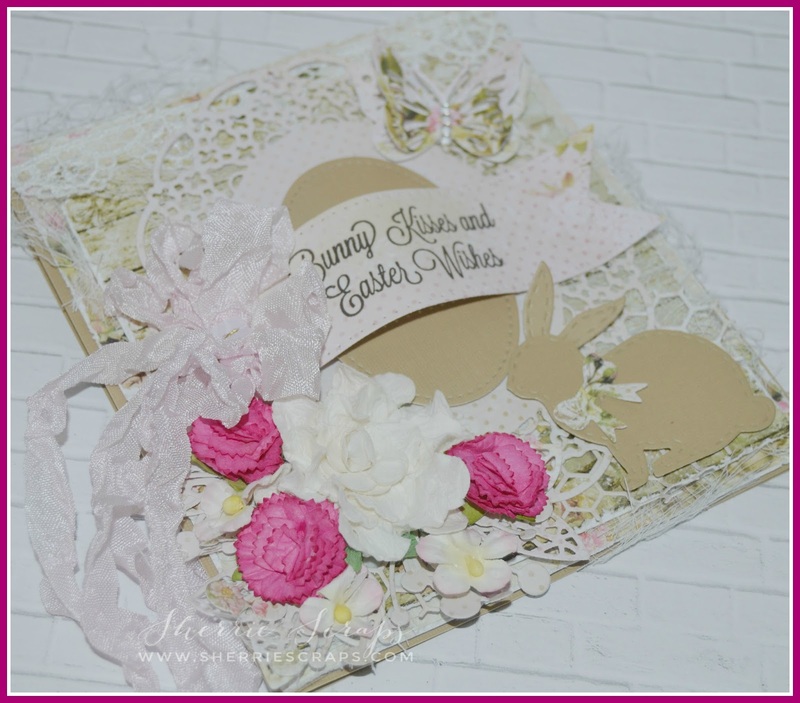 Today, I have a pretty Easter card to share with you using some beautiful papers from Lemon Craft~House of Roses collection. 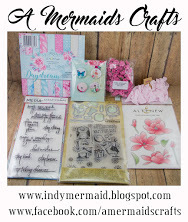 My sweet friend, Lisa from A Mermaids Crafts sent me this and I absolutely love, love this collection~Thanks so much Lisa! The base layer was distressed around the edges and then a layer of cheesecloth. 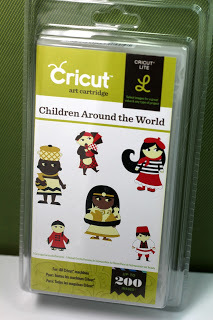 I then layered another beautiful panel with papers from this pretty collection. A border of lace ribbon from my stash is adhered down. The gorgeous oval is Spellbinders Oval Regalia die and then a Stitched Shapes Framelits die from Stamping Up for the smaller oval. 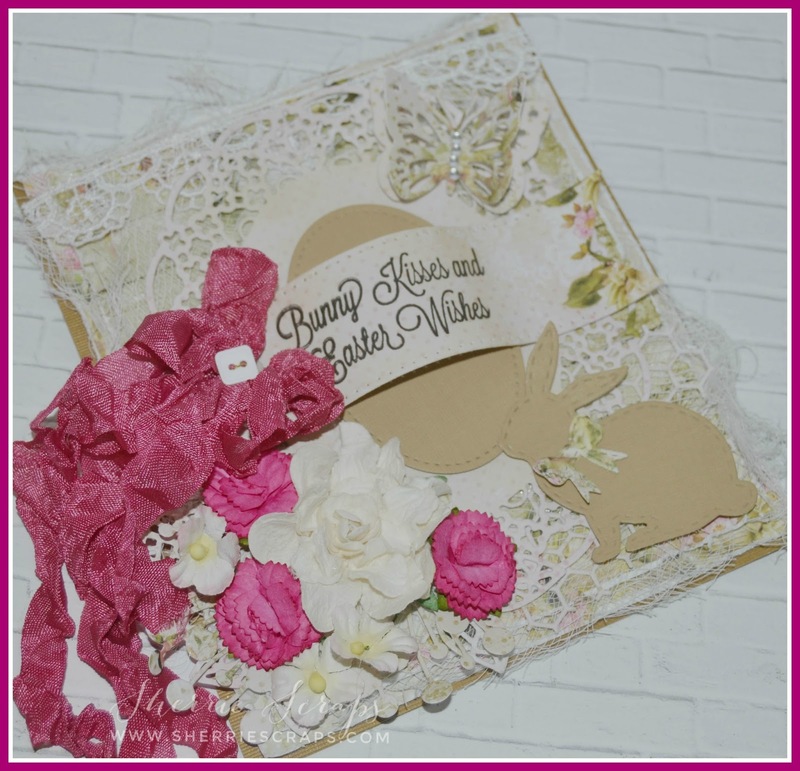 The banner is Sue Wilson Design Pierced Flags die and the sentiment is Jaded Blossoms Easter Basket Fun stamp set. The sweet little bunny is from Jaded Blossoms Spring Dies 1 (version 2) die set and the bow is Jaded Blossoms Bow Dies. The butterfly is Die Versions Whispers Pretty Butterflies die. 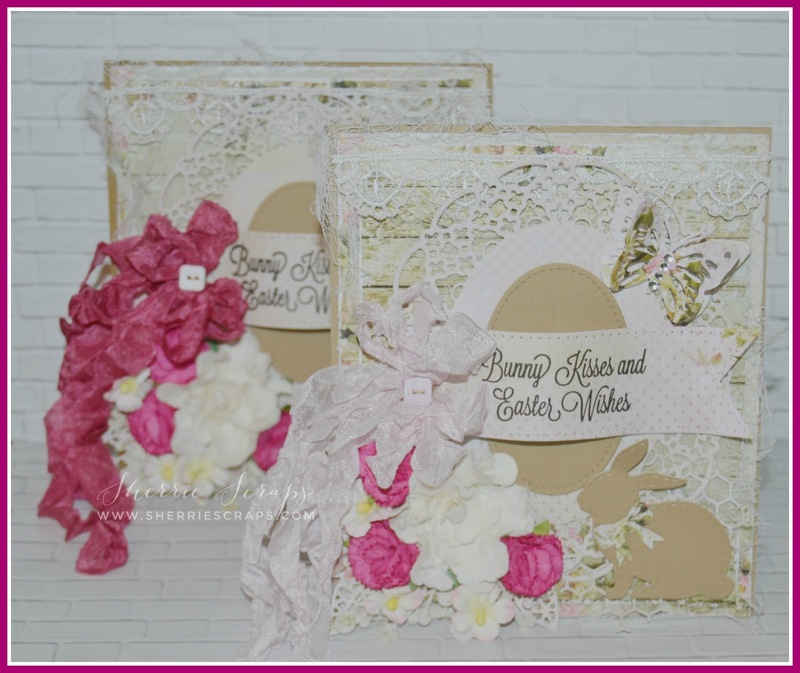 Beneath the gorgeous flowers, which are from Prima and Recollections is the Memory Box Chloe Stem die, Memory Box Honeycomb Remnant die and Sue Wilson Designs Mosaic Leaves die. The beautiful ribbon is from DL.ART and the little button in the center is Die Versions Wee Petites Buttons Galore. They are both beautiful witht e bunnies, butterflies, and flowers. Happy Easter to you and your family. Enjoy and take care of your Dad. These are just gorgeous! LOVING the bunnies!!! Sending continued prayers to your Dad!! Happy Easter! Absolutely gorgeous! !Love the pretty butterflies and beautiful flowers. Sending prayers to your dad and your family.Have a happy & blessed Easter. Of course we understand, Sherrie, family always comes first! Hope you all have a wonderful Easter day and enjoy spending time together! Your cards are beautiful! Such an elegant design and the texture and dimension are amazing! Happy Easter my friend- Both your cards are just amazing I love your design and the colors. I am so glad you are getting back into the groove. I love the papers also - I need to get some. Wow, Sherrie, these are absolutely stunning!! I love the layers and the details!! You've showcased the papers perfectly!! I love, love these, my friend!! They are truly spectacular!! What lovely Easter cards!I love the beautiful die cuts, flowers, ribbon! I hope your Dad is doing better. Beautiful card my sroends. I love teh layering and cacade of flowers fraping the side of the card. Absolulty stunning. These are lovely Sherrie !! Such beautiful designs and details ! Sherrie sending you and your family lots of hugs and prayers ! I hope your dad is doing better. These are such beautiful cards! Love Love Love them!!! Oh so very beautiful!!!! Love, love, love them both!!! Keeping ya'll in my prayers! These are so beautiful!! Love the fabulous layouts and those beautiful flowers! And those bows are so yummy!! Thanks for playing with Jo's Scrap Shack. These cards are just as gorgeous as the ones above. 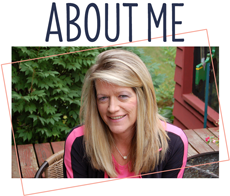 Beautiful, beautiful work, Sherrie!! Such beautiful cards, the ribbon is gorgeous along with the paper. The bunnies are just adorable! Hoping everything is going okay, wishing you and your family the best! Lots of thoughts and prayers my friend! 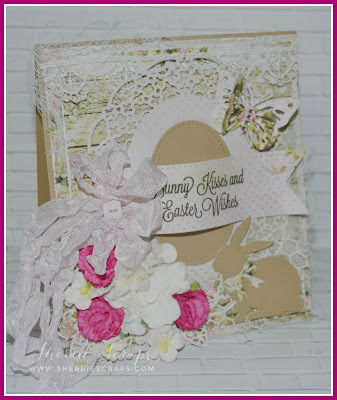 Sherrie this is gorgeous and just perfect for our 9th ‘ATG with CREATE WITH TLC’ challenge. Thanks for sharing your talent with us. Good luck and hope to see you play with us again.